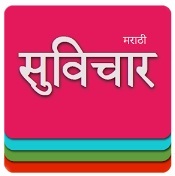 Dear Marathi readers we bring Marathi Suvichar Sangrah App which consist of many useful elements and thoughts given by great legends. Marathi Suvichar : Sane Guruji Suvichar, Swami Vivekanad, Mahatma Mandhi , Lokmanya Tilak, Ravindranath Tagore, Vinoba Bhawe, Dr Babasaheb Ambedkar and famous people. You can download our Suvichar App from below mentioned Link.